Bermudian Jessica Lewis — who was recently honoured in the Best of Bermuda awards — is competing in the 2013 Canadian Track & Field Championships. 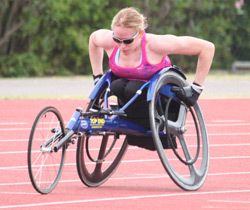 Lewis competed in the T53 Women’s 400 Meter Dash where she finished 2nd, and she also placed second in the 100m. Lewis is due to race the 200m this evening. Prior to this meet, she competed in the Ian Hume Invitational in Sherbrooke Quebec, where she claimed three silver medals and achieved the fastest 400m time she has done this season. Last year Lewis became the the first Bermudian track and field athlete to compete in the Paralympic Games. Well done. Keep up the good work. You Miss Lewis are already a winner.